Submitted photos Beavercreek JROTC present the flags during the Military Appreciation Night hockey game. Pictured are Dylan O’Connor, Evan Meno, Maddie Long and Adelle Ngo. Colonel Tom Sherman, 88 ABW/CC drops the ceremonial first puck at Kettering Recreation Center Ice Rink for the Military Appreciation Game between the Beavercreek Beavers and the Sycamore Aviators. Participating in the puck drop for Beavercreek was forward Joe Bordas, whose father, Lt. Col. Jason Bordas (445 AW), is currently deployed to southeast Asia. Sycamore Senior Nicholas Kerry is also shown. KETTERING — The Beavercreek Beavers hoped to keep their spotless record intact when they faced off against the Sycamore Aviators Jan. 11 at the Kettering Rec Center. It was Military Appreciation Night and the Beavers sported camo jerseys for the game. The Beavers also had some special guests in attendance for the game, including Col. Thomas Sherman, 88th Air Base Wing and installation commander, who dropped the puck for the ceremonial face off. Beavercreek High School junior ROTC honor guard, which is commanded by Cadet Dylan O’Conner and instructed by retired Senior Master Sergeant David Mackey, presented the colors, while retired Master Sergeant Cynthia Smalls sang the National Anthem. In addition, the Beavercreek High School’s pep band, led by Matt Frost, performed. Freshman Thomas Bush started the scoring for the Beavers midway through first on a nice shot that beat the goalie top shelf. That sparked Beavercreek to a 9-1 win. Junior Alex Folga shortly shortly after that off of a pass from behind the net from junior Marshal Enfield. Late in the first, sophomore Mason Mikesch pounced on the rebound of a shot by senior PJ Kosir and slid it past the goalie, giving Creek a 3-0 lead. Not to be outdone, Enfield capitalized off a big bounce off of the back wall on a Folga shot and snuck the puck under the goalie’s pads for a 4-0 lead at the end of one period. After a scoreless second period, Beavercreek got things going again early in the third when Bush scored off an assist from Enfield and then seconds later Bush returned the favor and set up Enfield for a goal. Late in the period, Mikesch scored on wrist shot and Kosir scored on a blast from the top of the circles. Sycamore got a goal late in the game on a strange rebound, however, Bush restored the deficit when he completed his hat trick shortly after, off a face-off scramble. The Bush-Enfield-Folga line accounted for six goals and nine assists for 15 points. Senior Kevin Bovair was in net for the Beavers and turned away 15 shots earning his 14th win. The victory pushes Creek’s season record to 16-2-1 and 10-0 in SWOHSHL play. Next up for the Beavers is a trip up to Strongsville next weekend where they will participate in the Ehrnfelt Tournament. The final two home games for the Beavers are 10 p.m. Saturday, Jan. 26 against Mason and Friday, Feb. 1 against Dayton Stealth, both at the Kettering Rec Center. 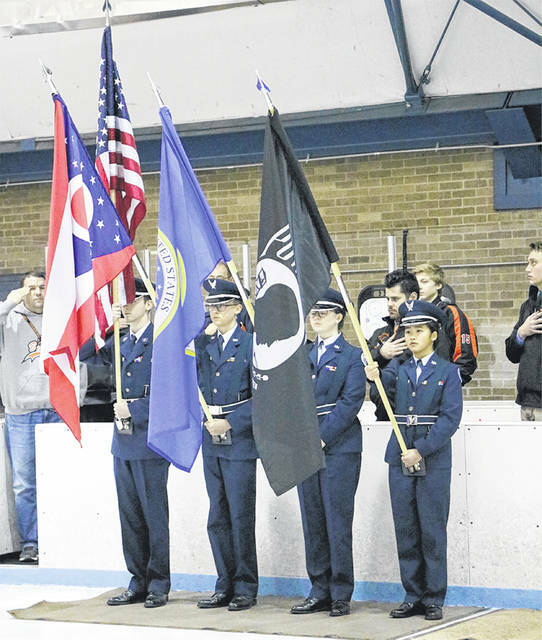 https://www.beavercreeknewscurrent.com/wp-content/uploads/sites/49/2019/01/web1_JROTC.jpgSubmitted photos Beavercreek JROTC present the flags during the Military Appreciation Night hockey game. Pictured are Dylan O’Connor, Evan Meno, Maddie Long and Adelle Ngo. 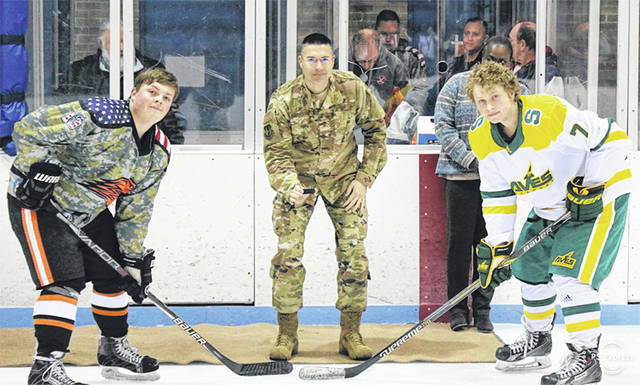 https://www.beavercreeknewscurrent.com/wp-content/uploads/sites/49/2019/01/web1_PuckDrop.jpgColonel Tom Sherman, 88 ABW/CC drops the ceremonial first puck at Kettering Recreation Center Ice Rink for the Military Appreciation Game between the Beavercreek Beavers and the Sycamore Aviators. Participating in the puck drop for Beavercreek was forward Joe Bordas, whose father, Lt. Col. Jason Bordas (445 AW), is currently deployed to southeast Asia. Sycamore Senior Nicholas Kerry is also shown.